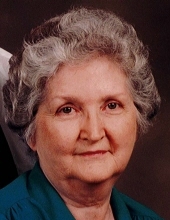 Francis Jeanette (Aaron) Noakes, 92, passed away peacefully at home with her family in Springfield, MO in the early hours of Wednesday, January 16, 2019. Known to family and friends as Jeanette, she was born in rural Pulaski County, MO near Dixon, growing up on a farm during the Great Depression. She married Ray Wilson Noakes of Rolla, MO in 1945 and lived in many different places in the U.S. and abroad as an Army spouse, raising five children along the way. Upon her husband's retirement from the military the family settled in Rolla where Jeanette worked as an operator for United Telephone Company until her own retirement. For the last four years she lived with her two surviving daughters in Springfield. Jeanette is survived by daughters Brenda Noakes and Sue Robinson, of the home; son Dale Noakes and daugher-in-law Angela of Foristell, MO; son Ronn Noakes and son-in-law James Chang of Springfield; grandson Grady Sams and partner Sheena Adams of Rolla; grandsons Alec Noakes of St. Louis and Daniel Jones of O'Fallon, MO; great-granddaughter Shelby Sams of Rolla; sister Jill Forthman of Dixon; niece Sandi Bowling of Kansas City; and numerous other extended family members. She was preceded in death by her husband, Maj. Ray Wilson Noakes; a beloved daughter, Leanne; her parents, John and Dora; brothers Howard, Dale and Johnny; and sisters Billie, June, Vivian, Joanne and Patsy. Giving even in death, Jeanette made a gift of body to the University of Missouri-Columbia School of Medicine. Family and friends will gather this Saturday to celebrate her memory. Family and friends are invited to celebrate her memory this Saturday, Jan. 26 from 11 AM to 2 PM in the Community Room of the Bank of Missouri, 216 W. 2nd St., Dixon. To send flowers or a remembrance gift to the family of Francis Jeanette Noakes, please visit our Tribute Store. "Email Address" would like to share the life celebration of Francis Jeanette Noakes. Click on the "link" to go to share a favorite memory or leave a condolence message for the family.